A few years ago, a project was confirmed by Robert Bosch GmbH that initiated the plans and construction for a 779 million- Yuan factory to produce advanced regenerative braking systems for electric vehicles. This 20,000 square meter facility will be located in eastern China in Nanjing; and is scheduled to open for business in 2019. This will create a whole new wave of electric vehicles and a different method to conserving energy. Regenerative brakes have been an idea in the making for the past hundred or so years. People have been trying to figure out how to harvest the lost energy that comes from braking, either on a bike, in a car or on a train. Recently, the technology has become more available for companies to fully take advantage of this idea. What regenerative brakes do is transform the kinetic energy from braking and return it back to the engine. When a car is driving along, energy flows from the batteries to the motor to keep the wheels turning, which provides the kinetic energy the vehicle needs to move. When the car needs to brake, the reverse process occurs. Power to the motor cuts off, leaving the kinetic energy and momentum to turn the motors instead. The motors then start working like generators to produce electricity instead of consuming it. Power then flows from these powerful motors back to the batteries, giving them a recharge. This process returns the lost energy from braking back to the batteries and is used to start the car back up again. The process is very similar when being used by a train, except the electricity isn’t returned to a battery, it is returned to the overhead power line that is fueling the train. This process can save modern trains around 15- 20 percent of their energy, and more technology is being created to increase this amount. 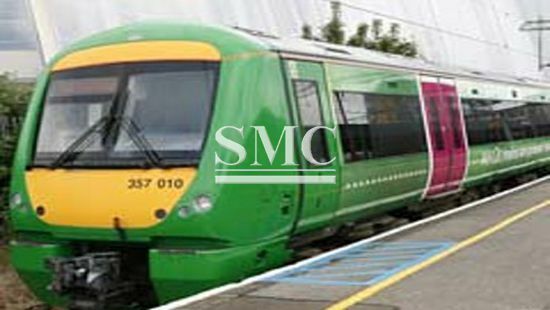 We here at SMC make it a goal to continue to grow with our consumer base, so we have a variety of different products that would aid in either building an addition to a train line or help the inner workings of the related vehicles. Visit our website to gain further insight into all of our products like rails, cables and transformers.